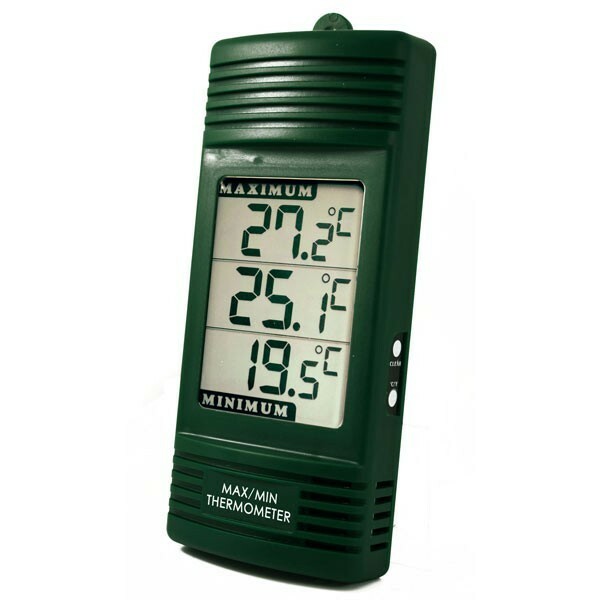 These digital max/min thermometers simultaneously display the actual temperature whilst displaying the max and min temperatures. Each unit measures temperature over the range of -49.9 to 69.9 °C with a 0.1 °C resolution and is ideal for recording temperatures of grow rooms, growing cabinets, greenhouses, pool houses etc. The unit is housed in an ABS case measuring 29 x 80 x 180 mm. The instrument incorporates a slot for hanging and is powered by 1 x AA battery (supplied). Easy to set and to read. I bought this for indoors, not the greenhouse, so the design is a bit clunky. How about producing a max/min for the home? - same function but with smaller, neater casing? I found the goods worked ok once I inserted the batteries. However they do not show the same temperatures. The room temp varies by 0.8C whereas the max and mins are only 0.1C dofferent. Not that much of a problem as it will all be relative. I am not using them for a greenhouse but to put in inoccipied houses to ensure the temp does not ho too low in winter. I've used these thermometers in a wide range of glasshouses. They are good value and do the job. However, in very humid / wet glasshouses the sometimes fail - the reset button stops working or the batteries corrode. The battery housing is not very waterproof. That said, they are absolutely fine for most glasshouses!